I've been consciously trying to take better care of my skin lately, for about six years I have really struggled with my skin and have had so many doctors appointments for it, as well as two creams and four different antibiotics. 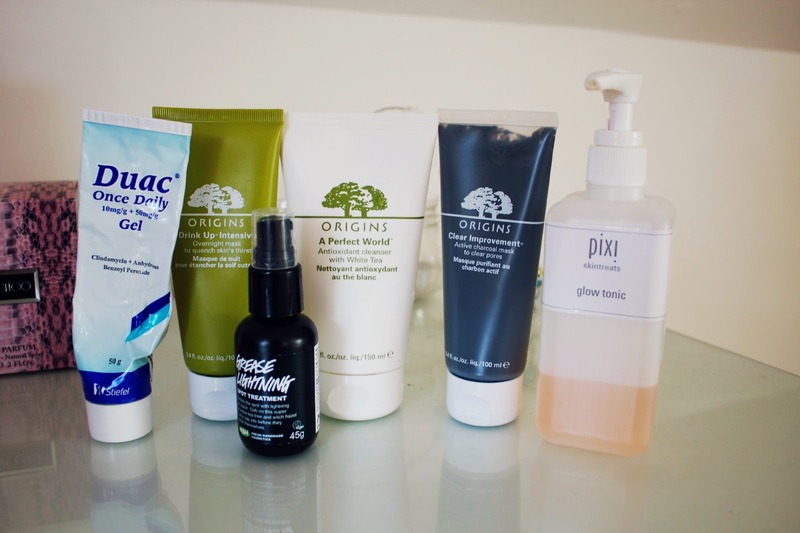 Recently it has been so much better so I thought I would share some of the skincare products I've been using as well as some other things I've been doing. 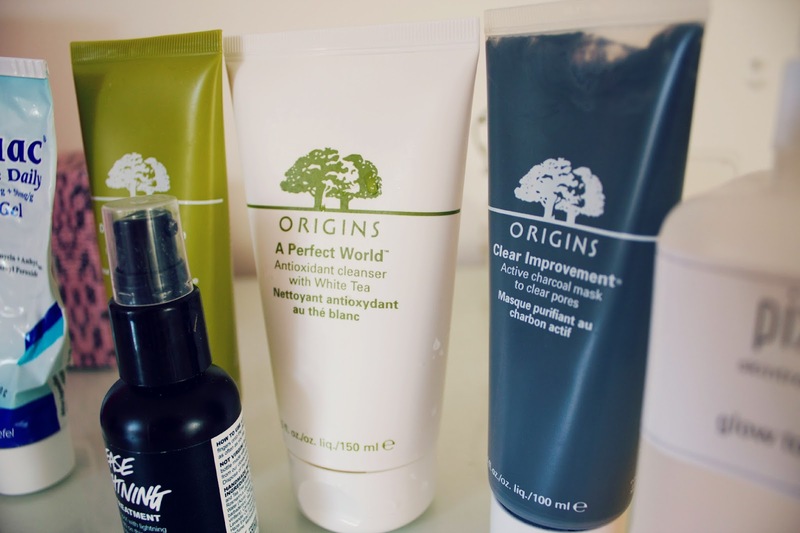 After I remove my makeup, I use the Origins A Perfect World Cleanser. For ages I used the Origins Mega Mushroom Cleanser but fancied a change so picked this up, the consistency of this is more "soapy" than the Mega Mushroom one so I think it would work better on oilier skin. But this has been working well for me! Once or twice a week I use the Origins Clear Improvement Charcoal Mask, this is a great product and probably one of my favourite masks, I genuinely think this has helped my skin and blemishes so much! Another mask I love is the Origins Drink Up Intensive Overnight Mask, I apply this about once a week before I go to bed. This is amazing if you have dry or dehydrated skin, you wake up in the morning to beautiful feeling skin! I promise I'm not sponsored by Origins haha! I love their products and just find that they work for me and don't irritate my skin or cause breakouts. Another great product is the Pixi Glow Tonic, I don't use this everyday but maybe every few days. This is a god sent for acne scars which I have a lot of, any scarring or marks on my skin fade away with this product, I just apply it with a cotton pad. Whenever I have a spot I use the Lush Grease Lightening, I generally use this at night and by the morning, the spot has either gone or significantly reduced in size. Finally is Duac Cream, this is something that I was given by the doctor for my skin however I believe you can find it online, this works wonders! It can make your skin quite dry for the first few weeks but after that, it's fine! A while ago I stopped drinking cows milk, I had heard that it wasn't great for you and I had also heard that a lot of people had given it up and found that their skin improved. Milk often has different chemicals added to it which can react with your skin, I drink Almond Milk instead, it also has a lot less calories than cows milk! Making sure you eat plenty of fruit and vegetables is also important for your skin and avoiding too much junk food and oily food. Apples are great to help tone and firm the skin due to the Vitamin C, Spinach contains antioxidants and Sweet Potatoes contain Vitamin A which helps fight off acne-causing bacteria!